Some of my faithful readers know that I have a strong interest in sustainable practices. For those of you who didn’t – well, I have this strong interest in sustainable practices. That means, basically, that I support and encourage the three “Rs” of managing waste. I’m also firmly in favor of renewable energy sources and organic farming. This was once considered fringe, “hippie” stuff, but it’s rapidly becoming mainstream, and hopefully will be standard practice before long. So I’m thrilled to tell you that this year I’m helping bring sustainable practices to another activity that I love – the world of running. I run, pace, and/or volunteer at over twenty events every year, and it bothers me how much waste they generate and send to landfills. That includes a lot of recyclable cans, bottles, and cardboard, and food waste (banana peels, half-eaten muffins, etc.) that could be composted. Trash from a small event last year. All of it went to the landfill. I figured there had to be a better way, and in my research I came across the Council for Responsible Sport and their certification program that recognizes waste reduction and redirection. Gazelle Girl 2015 – 3,000 runners, and this is all that went to the landfill. 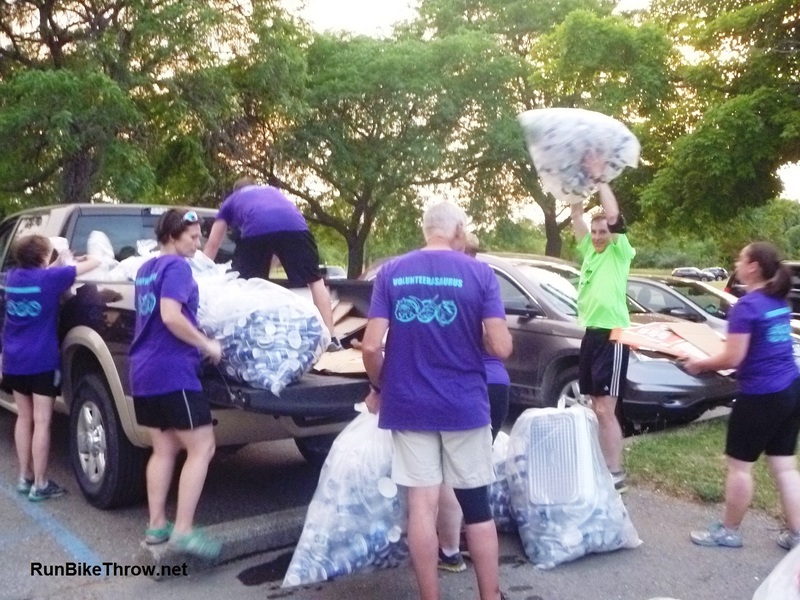 After volunteering at an annual women’s race in Grand Rapids that applies the CRS standards to achieve nearly zero waste (read my 2015 post about that here), I knew I wanted to bring what they did to the Ann Arbor area. So I approached my favorite running events company, showed them what was possible, and made my pitch to help them do the same. To what may be their everlasting regret, they accepted. And so RF Events “Team ZW” was formed. Saturday’s ZW crew – ready to rock that trash! Yours truly on far right. To get things going, we obtained a small grant from the Can’d Aid Foundation’s #CrushitCrusade, and used it to obtain training and waste disposal tents from ZeroHero, a company that specializes in sustainable waste management for events all over the country. We scheduled Trail Marathon Weekend, April 23-24, as our inaugural Zero Waste event. We recruited volunteers, deployed the tents, and hoped for the best. Stylin’ it on the trail! So if you’re going to a Running Fit race this year, look for the green shirts and the coolest tents ever, and know that we’re doing our best to make the sport we love better than ever! Below are more ZW photos from Trail Marathon. Enjoy!